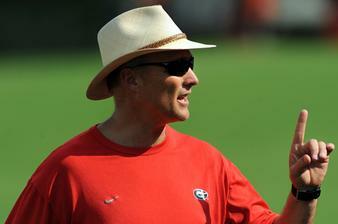 An Opinion On Sports: Mark Richt: Why Do Kids Keep Testing Him? It's been a very long time since I was 18, 19 or even 20 years old . That is the biggest understatement since the declaration that the ACC is a basketball conference. The passing years have eroded the recollection of the reality of perhaps how dumb for my age I actually was. Having admitted that, it continues to baffle me how kids the same ages as I mentioned above repeatedly push a coach like Mark Richt, even though his track record proves to his players that he will sit you. Furthermore, if those players are repeat violators of behavioral standards, he will forget you. Being a Bulldog is a privilege, but that privilege can be denied those who abuse the membership in that family. Tavarres King and Dontavious Jackson have been suspended from the Bulldog family because of their arrests on charges of underage drinking. Jackson will miss at least six games this coming season, and King a minimum of one contest. Jackson's penalty is half of the season. Heck, he might as well red-shirt. Or transfer for that matter. But the point I was reaching for is that these two kids have seen past teammates suffer at the disciplinary hand of Richt. You screw up, you miss games. You mess up really bad, you're gone. Why do these kids keep testing Richt? He is a man of principle, which means he will not give in to this insubordination by his players. Why do players keep forfeiting the single thing that is most cherished by them, that is playing time? Game time. Time between the Hedges. Time wearing the red headgear with the prideful 'Power G'. Perhaps I was that hard-headed, that stupid. I'm just glad time has eroded the truth of that possible reality.